I scream, you scream, we all scream for ice cream! As I was walking outside yesterday, the temperature was falling, and it reminded me of a cloudy and drizzly late fall day in New England. My mind then wandered off to the idea of ice cream. When I lived in Boston, ice cream was a treat for any time of day or year. Yup, deep in snow, Bostonians ate ice cream! I was hankering for some really good yummy, day's of yore ice cream. I don't admit this very often, but I might as well say it to the world of the blogosphere. I once had a job at a designer ice cream store in Boston when I was in high school. The reason why I don't admit it very often is because I was the worst employee an ice cream parlor could ever hire. I was in it to eat ice cream and making milkshakes for myself during my shifts. I really didn't want to do all the side work that was required during the down time, like cleaning the bathrooms, mopping the floors, wiping down and cleaning tables and counters, ya know, the stuff that needs to get done all the time for food service health. Now, I think I would make a much better ice cream parlor employee because I understand business, the bottom line, customer service and importance of cleanliness of a food establishment. Oh well, that was then, and this is now, and now I am more interested in being a consumer of ice cream, rather than a server of ice cream. On Christmas, I found myself wanting ice cream, but good ice cream like Ben and Jerry's, but alas all grocery stores were closed for the holidays. I did have an extra 3 cups of local grass fed cream in the fridge because I did not make it into butter, so I decided to try and make my own ice cream with this cream. 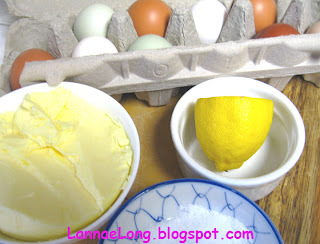 I did not want to use egg yolks, so I was in search of yolkless ice cream recipes. 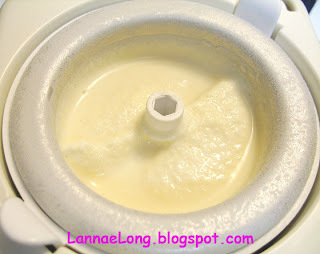 I went to allrecipes.com, and came up with 2 recipes, one for vanilla and one for fruit ice cream. The vanilla requires an ice cream maker, and but the fruit ice cream did not. I thought to myself that I could make two different types of ice cream at one time. Wow! The berry ice cream was really easy. The recipe called for frozen berries, cream, sugar and vanilla. Over the summer, I picked a quart of blueberries from the super secret blueberry patch and put them up in the freezer. Instead of using sugar, I used honey from my friend's bee hive. The vanilla was interesting too. In 2005, nearly 5 years ago, I put 3 vanilla beans with a cut long-wise into a pint of vodka. Now, I have a fabulous vanilla extract. The aroma, and flavor is just as good, or even better than the little bottles you can get at the grocery store. The method I used to make the berry ice cream is that I put the cream, a squeeze of honey and a small drop of vanilla extract into a blender and stirred the ingredients up for a second. Then, through the hole at the top, add the berries while the blender whirled. When all the berries are pureed into the cream, stop. 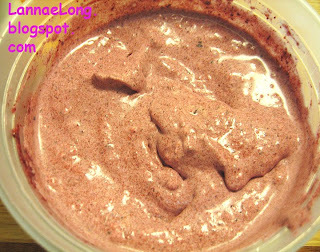 Put the thick soft serve textured berry cream into a freezer container and freeze. The vanilla ice cream called for cream, milk, sugar and vanilla. Again, I used honey instead of sugar. The recipe on allrecipes.com called for 1 tsp of vanilla extract per 1 quart of cream plus 1 cup of milk. I only made 1 1/4 cup of vanilla ice cream, and I used 1 tsp of my vanilla extract. I also did not measure the honey, I just plopped it in, and I think I added a little too much honey. The cream and milk, however, I did measure according to the allrecipe proportion. I used 1/4 cup of milk and 1 cup of cream. I stirred all these ingredients in a bowl, and then put it into my mini ice cream maker and churned it for about 15 minutes. 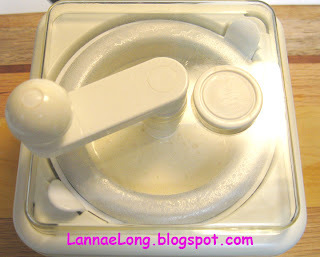 When I was done churning, it was a bit soupy, so I put it all into a freezer container and put it up in the freezer. The result is I need to watch the flavor and sweetening proportions for the vanilla ice cream. The product I made is really really flavorful, and it feels like it is only appropriate to eat one or to bites at a time. It is not as dense with milk fat as those top 5 ice cream places I have been to, but that is ok. The blueberry ice cream is also not as dense with milk fat as those top 5 ice cream places either, and that is also ok. The blueberry ice cream is slightly gritty from the small pieces of blueberry skin. Maybe next time I might thaw the berries and use the juice for flavor instead of the whole berry. I used very little honey and vanilla in the blueberry ice cream, so the berry flavor is not masked and is allowed to come through. I like both of my creations. For whatever it is worth, spending time making the ice cream, and tasting them through all the steps of making the ice cream, my craving for ice cream has been quenched. Success. It is a couple of days after Xmas, and it feels likes a Sunday breakfast day. We were getting ready to go to Fido's for breakfast because they have a really nice breakfast menu, generally there is not a wait, the veggie sausage is so much better than the pork sausage, and the coffee is really good. But, as he bicycled over to Hillsboro Village, he saw that Fido's is closed for the holiday weeks of Xmas through New Year's Day. We quickly regrouped and decided to make breakfast at home. I sent him to Provence Bakery for bread, and I decided to make the rest of the food. We felt so European when we came up with our backup breakfast plan. He was bicycling around Nashville to hand carry the bread back to the house, and I was preparing Hollandaise. It is so rare that I have all the ingredients in the house for a rustic breakfast. But for some reason, all the ingredients aligned and I was ready to roll out some breakfast while he was pedaling to Provence Bakery for bread. On the menu: Hollandaise sauce over scrambled eggs, bacon, and toast, and bread chunks with Burgundy France Pinot Noir grape jelly. I usually don't have fresh lemon in my fridge, but I had 2/3 of a lemon from something else a made a few days ago, so I had the pivotal ingredient for Hollandaise. With lemon in the fridge, it was a done deal, we were having a really nice homemade breakfast. The Hollandaise sauce was a very dark yellow/orange color because the free range local egg yolks were so dark orange-red in color. The sauce was such a vibrant color that you can't get from industrial grain fed chicken eggs. I did the whisk and hot water bath double boiler method to make the Hollandaise sauce. There is a fine line between to hot water and too cold water bath. 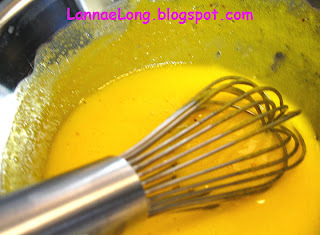 I kept on whisking to keep the sauce moving, and not have the egg yolks scramble. I also took out the top pan out of the water a few times to make sure there was not too much heat. I succeeded with a Hollandaise sauce that was deceptively light and slightly tangy. 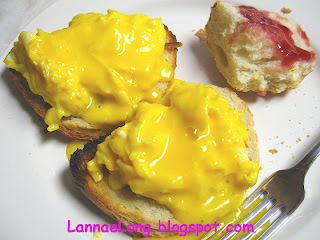 There is nothing "light" about egg yolks and butter, but I got lucky this time with this batch Hollandaise. Oh, was I happy that the sauce turned out! Oh happiness! I was thinking positively about the sauce as I was making it, and I was so happy when it turned out right!! I decided not to poach eggs for this effort because I did not want to waste the egg whites I had left over from separating the eggs. I added a couple more whole eggs to the egg whites and scrambled them for the dish. Again the egg yolks are so dark that 2 eggs and 2 egg whites are still more yellow in color for scrambled eggs than industrial eggs. The bacon I had was already cooked (see previous post) and put the cooked strips in the freezer. The local bacon is traditional salt cured and hickory smoked. I used only 1/2 piece of bacon per piece of toast, and the bacon just added such an unbelievable depth of flavor to the dish. I assembled our plates starting with toast of bread I cut off from the loaf of sour dough bread he hand carried while bicycling around Nashville. I crumbled up 1/2 piece of the locally grown and smoked bacon on to each piece of toast. I placed the mostly-egg-white scrambled eggs on top of the bacon. then a I spooned on the Hollandaise that was being whisked all the time the other ingredients were being prepared. To top off the plate, chunks of left over bread that was not toasted and topped with Burgundy France Pinot Noir Grape Jelly. As you can see, the chunk of bread and grape jelly had a few bite marks in it before I photoed it because I could not wait to eat the jelly. We love the flavor of the Pinot Noir Grapes on bread. The complex grape flavor is like no other grape jelly in the world. Fantastic! The eggs, bacon and Hollandaise were so satisfying because the ingredients was so flavorful and wholesome to begin with. I am so pleased with this breakfast, and so content. Usually, everything I cook has at least one local grown (within 100 miles of my house) component to it. Years ago, I did an "eat locally" experiment for a week, when we ate only locally grown foods with the exception of salt, brown rice (wheat and grains don't grow here), and coffee (I need coffee). At least the coffee we used and still use comes from Bongo Java/Fido, a locally owned coffee shop selling Fair Trade coffee. What came out of that experiment was a revelation that vegetables grown in the traditional way and picked ripe (vs GM industrial unripe produce), free range grass feed meats (vs grain and soy fed industrial meats), and free range grass fed non-homogenized milk and generally taste better. As any good chef will say, good food starts with good ingredients. In my opinion, the local small farm foods I have found are better ingredients than industrial grown, fake flavoring added products. Here are a few local items I made and used this week. I love the taste of bacon. I will eat most any bacon put in front of me. But, when it comes to cooking and using bacon at home, I prefer Scott Country Bacon which is nitrite and nitrate free, sugar and salt cured, and real hickory smoked bacon. I bake the Scott bacon in the oven, which keep the bacon from wrinkling up and helps the bacon from uneven cooking and burning Baking the bacon fills my home with a lovely hickory smoke aroma that comes from the real hickory wood the Scotts use to create their bacon. My house smelled really good. I can bake the whole pound of bacon at one time, and then drain all the bacon fat at one time for use at another time. I am working on the idea of making my own bacon, when Matt has time. We have the smoker, we live in the "Old Hickory" state, and can get local hickory wood for the smoker. I need to research using locally made honey instead of sugar to cure the pork, and I need to figure out what salt I want to use to cure the pork. I have identified local pig farmer who as free range grass feeds pigs. Next stop, making my own bacon. Earlier this year, my small farm (21 cow) local milk supplier went the way of many other small dairy farms. The family just could not make ends meet, and sold the farm and moved north for other endeavors. How sad for them, me and all who enjoyed their milk. What I recall about this grass fed, free range cow milk was the depth of flavor the milk had. The milk had a nutty, sweet, and creamy flavor. When the milk coated my tongue, it provides a irresistible nutty real milk texture and flavor as well as an equally warming aroma in my nose. The flavor, texture and aroma of this milk is quite similar to the milk and cream we used in our cafe au lait in France. 30 years ago, I had my first love affair with French cafe au lait. The coffee there tasted so good, it had a smooth, nutty, and warm quality to it, that I just wanted to sip and savor each drop. For nearly 30 years, I had been chasing the coffee bean to duplicate the fabulous French coffee I had in France. I stopped using the big industrial coffees in cans from the supermarket, whiched helped cut down on acrid biting (in a bad way) flavor, but I never was able to duplicate the French cafe au lait flavor, not even with really expensive French roast coffee beans. Then, a few years ago during my "eat locally" experiment, I found this local grass fed free range milk from a small local farm. When I sipped on that milk for the 1st time, I had a wave of memory through my taste buds and aroma through my nose. I remembered that French cafe au lait at sidewalk bistro in France 30 years ago. It dawned on me that it was not the coffee bean that made that smooth, delicious nutty flavor of the cafe au lait, rather it was the grass fed free range milk that made that cafe au lait. Every time I used the local milk in my coffee, it was like being transported for a moment back to France. The only milk I can find right now is Rebekah Grace Milk, it is milk from group of small dairy farms in S. KY, and I pick up my milk in returnable glass containers at the Nashville Farmer's Market on Saturdays 10 am - 1 pm. The milk is pretty good, but I don't know which farm my milk is coming from. None of the Rebekah Grace milk is homogenized. It will suffice for now, and I am glad that my purchase support the small dairy farmers within 100 miles of my house. 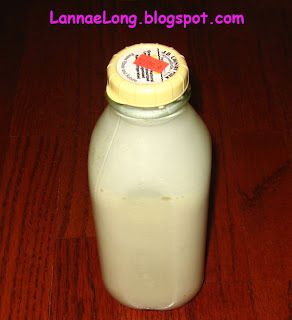 But, if anyone has word of a local small dairy farm with glass bottles, let me know and I would love to try the milk. This year, for the first time Delvin Farm grew popcorn. It is so dang easy to grow apparently because you grow the popcorn, and then let the popcorn dry on the stalk. That is it. No processing, nothing. I bought one small bag (about 1 cup) of the popcorn, and regret not buying more. I have only a couple tablespoons left, and I am hoarding the kernels. Delvin's popcorn is lighter, than industrially made popcorn. 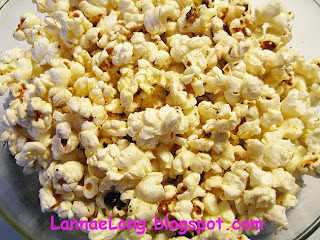 The "half pops" are nuttier and easier to crunch than other popcorns. I really like the texture of the Delvin half pops, and the texture is tender enough to not break a crown or bust a root canal. How did I make this popcorn? I used about a tablespoon of the bacon dripping grease and a sprinkle of dried cayenne pepper I dried last year to pop the corn in heavy bottom pot. I put the popcorn in a bowl, and then melted some of my home churned butter to pour over the top to make it a really decadent treat. You may be saying pork fat and butter? Is she nuts? That is so unhealthy! True. But, I don't eat locally grown popcorn all the time. I decided that if I were to make this special treat, I was going to really make it a special treat. The bacon fat added such a lovely hickory smoke aroma and flavor, the cayenne added that zip to the experience, and well, home made butter, is there anything better? I only have one more pot of Delvin popcorn to make, and when I make it, you bet that I will be making it up in the most decadent manner that I can. I am going to savor and enjoy every bite for sure. I went back to Delvin over last weekend begging for more popcorn. They looked at me and said they were sold out until Fall 2010 when they will harvest the next popcorn crop. Then the guy did say that he wasn't completely out of popcorn, but him and his family kept some for themselves to eat through the year. I looked at him and debated in my head whether I could make a deal with him for another one cup of their golden popcorn. I decided not to try and wheel and deal this year. I decided to enjoy the memory of making and eating the 2009 popcorn harvest, and enjoy that feeling of waiting and anticipating for the taste, texture and aroma of the 2010 popcorn harvest. It is like being a kid again when I had to wait days, weeks or months for my special birthday dinner. When we were in NYC this time, it was Halloween weekend, and we had a baby baptism and wedding to attend. But, we did get to do some other things that were a big deal. We got to see the Halloween parade, with thousands of other people, we got to see the the general population of NYC in costume roaming the streets, I got to see two sections of the NYC Marathon, we to see many shops and markets on Bowery and Canal streets, we got to see a bunch of flea markets, we got to see holiday open area markets, and we got to see the All Saints Day festival. Every time we walked out of our hotel it was something fun, new and exciting! We didn't have any plans besides the family obligations, and we didn't need plans because there was so much going on in NYC. I miss living in a big city where there are a ton of things going on all over the city all the time, on the one hand, but on the other hand, I have really gotten used to the slow pace of life here, so I don' t know if I could keep up with the pace anymore. Our days and nights were so packed with things to do and things to see, and great weather to roam the city, that I was ready to come home and relax. Before we left NYC, we had time for an early lunch before catching a plane, so we wanted to experience something cozy and very NYC. We needed to go to diner. Cozy Soup and Burger in Greenwich Village fits that bill. It was one of the favorite college haunts. It is always on the list of places to go to get the NYC diner experience. There are a few guys there that we recognize from nearly 30 years ago, so it was a bit like going home. Cozy's used to be only a diner counter back in the 1980s, but since then, they bought into the adjacent space, and now there is table service too. It was a nice low key way of ending our Halloween weekend in NYC. Cozy Soup and Burger is open 24 hours per day, so if I would want a hamburger at 3 am, or 3 pm, the burger is available. This is one of the finest burgers in NYC. They keep the ground beef in a drawer, and then when you order a burger, they scoop out the beef and smash it onto the griddle to fry up the burger and then they put a dome over the burger to steam and melt the cheese. 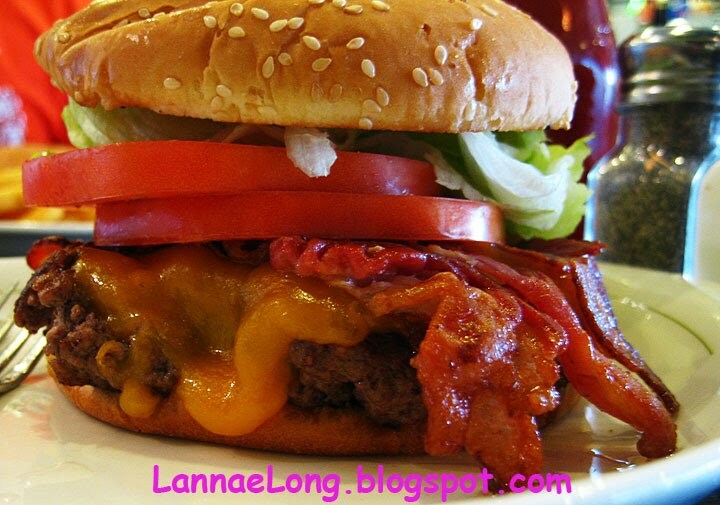 The texture of the burger is exceptional. The menu says the burgers are only 9 oz, but I suspect that it is closer to 12 oz, or 3/4 lb. If I lived in NYC, I would order a burger and fries, eat 1/2 for lunch and take the other 1/2 for another meal later, there is that much food on the plate. It probably is a good thing that I don' t live near Cozy's because I would eat these burgers all the time. A few days ago I was driving down 8th Ave South just like I have done on many days in the past, but today I saw the lights on in a little white building with a sign saying Thai Food. I quickly took a double take, trying to remember what was there before. What I remember from years gone by was that this was a "used car lot" next to the Berry Hill Animal Hospital. The sign said, and still says P & K Auto Imports. I remember a few years ago, the used cars disappeared, and I thought the little white building was sitting empty. I just thought the little white building was going to be yet another 8th Ave building to go into decay. Was I surprised when I saw the lights on in the little white building, and it was not at all in a state of decay. I had to satisfy my curiosity and find out what the story is about this little white building, so instead of going to the gym, I went into the building. I went inside was met by a really interesting visual. The interior is completely hand made light wood paneling, wood pillars, and wood ceiling. The trim is all hand made and stained. It is really a neat-o look and feel. The owners are a married couple of Thailand origin, and the wife met me at the door. She let me sit down and review the new, and limited menu: braised pork in 5-spice and shiitake, or pad thai for my takeout menu. I opted for to try the pork. She brought me tea while I waited, and I started talking to everyone who was in the restaurant. And who should be there but Patti and Win Myint. Patti, as I know her, is the Matriarch of the International Market on Belmont Blvd. 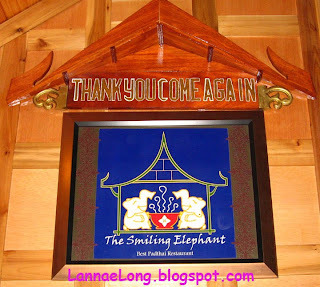 I was talking to Patti, and she 'fessed up that Sam, owner of Smiling Elephant is her little brother, who thinks that his cooking is good, and good enough that people will want to buy his food. Sam owns the auto repair business and the former used car lot, and has been a mechanic for years. He also is a wood working kind of guy, and has spent the past three years making all the wood paneling, pillars and ceiling. Since he renovated the complete inside of the little white building, he might as well open his restaurant and make a little income off of the building, maybe make a little money to help send his kids to college, and have a little white building business waiting for his kids when they are ready. I then asked about the menu, Sam said his pad thai is the best. He really thinks his pad thai is the best, and even put that on the sign. Look at the photo, it says, "Best Pad Thai Restaurant". I thought to myself that he has to be kidding, there isn't really good pad thai in this town. Then again, if his pad thai is just better than the best in this town, and the best is only ok, then I guess he can write that his pad thai is the best. At that time, my take out meal was ready to go. Sam handed my container to me, and said, there is sauce in there, make sure you put the sauce on your pork before you eat it because the sauce is really good and a part of the dish. He also said the sauce is home made, it is his special recipe. It is a vinegar, garlic and chili based sauce. As I was making my way to the door, he said, "Use the sauce, it is really good!" I said, "Yes, the sauce, I will use it!" At home, I opened the box and pulled a little pork out of the box to taste it. Eh, it was ok. It was braised pork with 5-spice and shiitake flavor. I put it in the fridge for lunch the next day. The next day, I heated up the pork and rice. I looked at the sauce, and poured some of the sauce over the pork. My taste buds were so happy! I could not get enough! Sam was right, the sauce, the sauce, use the sauce! It was definitely an ensemble dish, a bit of rice with pork, braising liquid and the sauce is how it is to be eaten. Really good. Now, I was ready to try the pad thai after being pleasantly surprised by the pork dish. I needed to know if Sam's pad thai is the best. Off we went to Smiling Elephant the next day to see if Sam's pad thai is truly the best. We ordered the pad thai, and I looked around and decided to talk to the people who were there. There was Sam and Patti's baby brother Ju there, and he is just a character. Ju owned Salathai, the former Thai restaurant on West End (now it has been torn down to make way for a mini-strip mall with generic chain restaurants in it). Salathai ended when the property owner wanted to do something else with the property. Ju said he told Sam to not open a restaurant. It was too much work, too hard, and there isn't a lot of money in it. He said Patti said the same thing, too hard, not enough money in it. Sam and his wife's really want to have this restaurant, they believe in their cooking, and they want to feed Nashville their home cooking. Sam said they are starting slowly with only two menu items, and will add items as the restaurant matures. At that time, the pad thai came up. It was certainly different that any other pad thai in town. It had no sugar or tamarind in it, it had no ubiquitous corn syrup sauce on it, rather is is more like a good New York Chinatown special fried rice dish, but made with noodles. I don't mean the mushy msg fried rice you get here around Nashville, which I don't care for, I mean New York style wok fried good fried rice. The noodles Sam uses are wide soy bean noodles, not rice noodles. The benefit of the soy bean noodles is that they hold up to stir frying, they have a toothiness that I like, and they don't become mushy. Rice noodles are hard because they become a pile of mushy paste if not handled correctly, so I think that using soy bean noodles is really a smart move. He added eggs, tofu, fresh bean sprouts, peanuts, scallions, tiny shrimp, onions, and zucchini. He served the dish with lime to squeeze on top. There is also the super secret, crushed red chili pepper and spicy thai style vinegar to put on the pad thai, but you need to ask for it. Sam and his wife are more than happy to bring the caddy with the condiments for the pad thai. By the way, they use olive oil. Those who are interested in omega-3 healthy oils, they use olive oil. Look at these eggs! They are so colorful and beautiful! 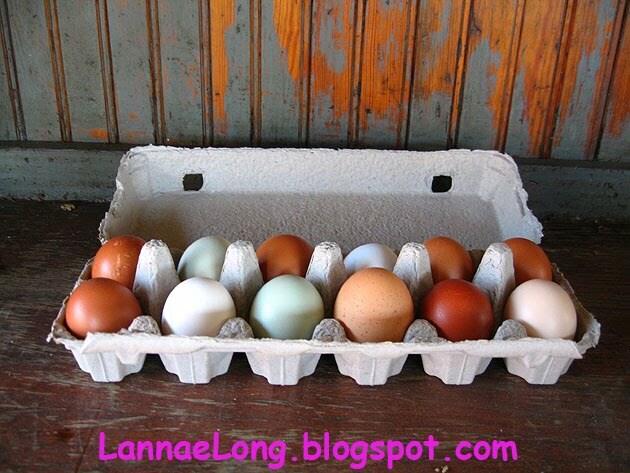 These eggs came direct from the farm where the chickens roam free during the day. Some of the chickens are 2nd generation, having been, laid, incubated and born on the farm. The chickens flock around the farm during the day, and spend quite a bit of time in the wooded area adjacent to their home. In the afternoon, they come back to go into the coop to rest and lay eggs. The chickens are really happy at this farm. I can't wait to eat my very happy eggs. It has been a long time since we made a turkey because we have been so lucky to be asked over to friends' homes over the past few years. This year, we were again invited to our friends' home to enjoy their company, their cooking prowess, their lovely farm, and their sweet farm animals. They had a 27 lb turkey, but this year, I wanted a turkey too. My friend at work has the equipment to make Southern Fried Turkey. 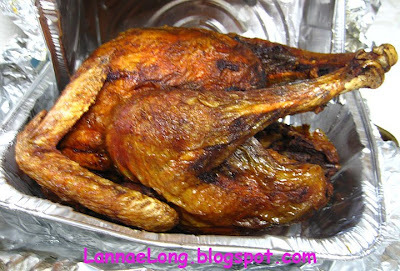 He had a small turkey, he injected it with a bunch of cajun style spices and deep fried it. Oh, it smelled so good when I was driving around with it in the car to our friends' farm. So, needless to say, with 2 turkeys at one Thanksgiving meal, there was a lot of turkey left over. What to do with turkey? Well, we had nearly the whole Southern Fried Turkey left over, and there is only us and a cat. The cat doesn't eat turkey with cajun spices (too spicy for her), so she is no help moving thee turkey out of the fridge, so eating the turkey fell upon us humans. That is a lot of lbs of protein for us. 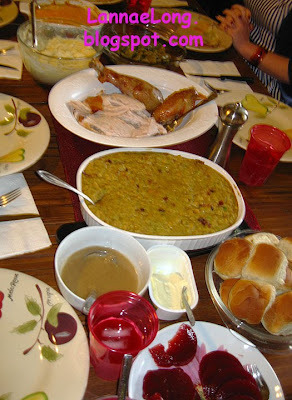 We spent a few meals eating turkey straight up with gravy, cranberry sauce and stuffing, but it was getting a bit fatiguing for my taste buds. What to do next. Well, I went on a biz trip on Monday after Thanksgiving. I was feeling a bit like "Hooray! I get a break from eating turkey!" One guys I was on the biz trip said he made is own Tur-duck-en, and he said he definitely had more lbs of protein left over that I did, and he said he made a bunch of pot pies from the left over meat and put the pot pies in the freezer for future easy meals. Oh what a great idea! Because we haven't had turkey leftovers for years (celebrating at other's homes, we didn't take left overs), I have become out-of-practice as to dealing with turkey leftovers. The pot pie idea was just a spark of genius for me. So the guy said he got pre-made pastry dough, and then filled it with pot pie stuff, and then rolled the top pasty dough on top, and then put it in the freezer. The guy eluded to the finding fresh rolls of pastry dough, not frozen, but we could not find any such thing is our local store, so we went with frozen dough. 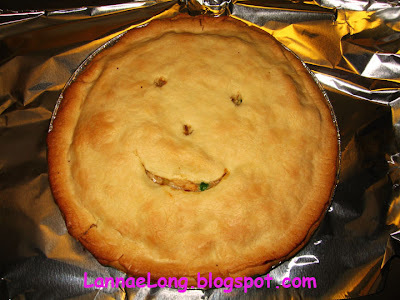 For the filling, I small diced turkey because I really dislike huge chunks of protein in pot pies, stir fries, stews etc. We got a bag a frozen mixed veggies, and tossed some in with the turkey. We got one can of cream of mushroom soup, and stirred that with the turkey. Three ingredients all stirred up, and I was wondering if I should add paprika, smoked paprika, garlic, caramelized onions, or something else besides, turkey, frozen mixed veggies, and a can of condensed soup. Nope. That was it. I tossed that mix into the pie shell, topped the mix with the 2nd pie shell, and baked the pot pie for about 30 minutes at 375F. The result: it was a good way of eating yet another turkey meal. The crust was better than pre-made frozen pot pies because the pre-made pot pie crust has been formulated for microwaves, not conventional ovens. This frozen crust was formulated for a conventional oven, and it was good. Believe it or not, this August, yes August 2009, is the first time I have ever owned a microwave oven. Yup, I have never owned a microwave oven. Now, in our new house, the former owners left a very nice microwave for us, so this is the 1st time ever to own a microwave. Just to let you know, all these years without owning a microwave, all the frozen bread, pie crust, pizza crust etc that is formulated for the microwave, does not do well being baked for an hour in a regular oven. That is why I don't generally buy pre-made frozen bread/crust products because it is just bad while made in a conventional oven. 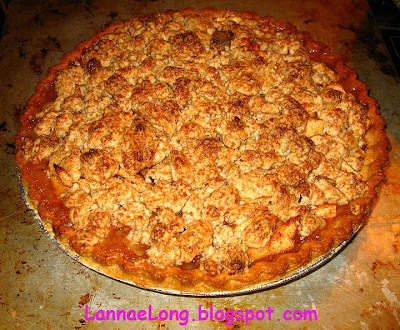 The plan is, next time, I will attempt to make my own pie crust. I put some turkey up in the freezer, there is mixed veggies still in the freezer, and all I need to do is get more condensed soup. 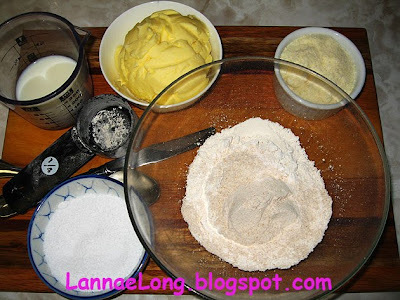 The pie crust, I am going to modify the cracker recipe to make the crust. Mark Bittman did mention that the cracker recipe is a modified pie dough recipe, so I I think I have the tools to make pie crust now. I just won't put cheese in the crust dough, it will just be butter and cream. Mmmm yum. I have two things about cooking that I really want to blog about, and the success of the issues comes in the form of these cheesy crackers. 1st, weeks ago and recently, we went to City House and had a liver spread with house made crackers. I asked where I could get them, and the answer is always the same - Tandy (chef and owner) made them. The crackers are so good, and I have been thinking a lot about making my own crackers. 2nd, I have been off Food TV for years, after Scripps bought the network and changed the format from cooking shows (Julia Childs-esque shows) to fluff shows that teach nothing about food nor cooking. I really liked the Food TV channel when it first started because I could watch chefs make food, chefs pair food with wine and beverages, and see what the different stages of recipes should look like. I have found the answer to a visual cooking show, the Minimalist on the NYTimes video website. Mark Bittman shows easy recipes on video, and he is making cooking accessible. Mark Bittman has gotten me back into the kitchen to make tasty food. I had only a small amount of white flour, so I had to use whole wheat to get the proportion of flour to butter to milk right. I followed the directions on the video, and the dough became a ball in the food processor, and I rolled out the dough onto parchment paper to bake at 400F for about 13 minutes when the crackers became golden brown. These crackers are like a stiffer and thinner savory pastry crust, nice and light. The flavor is really delicious. The butter, the cheese, the sprinkle of salt are a nice combination. These crackers are really simple to make, and after I measured everything out, it really did only take 20 minutes (as Mark Bittman's recipe says) to make crackers. I really love the treat of crackers and butter. After learning how to make butter (so easy!) 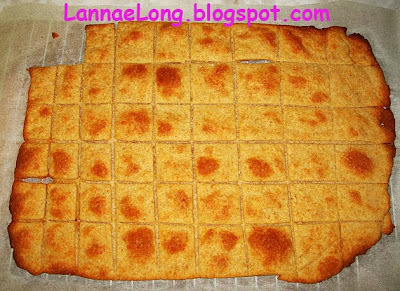 and how to make these simple crackers (so easy again! 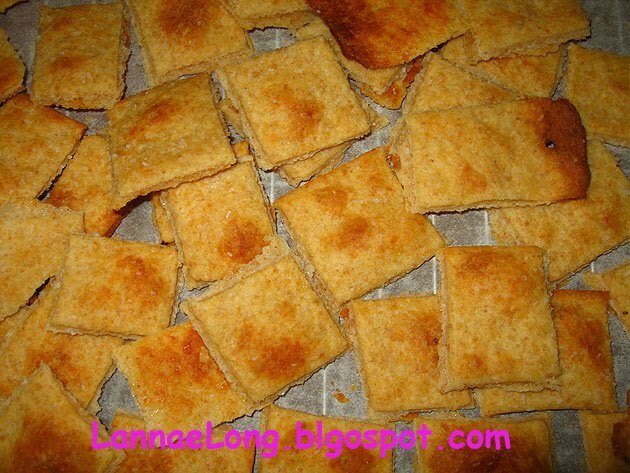 ), I can have my one of my favorite treats: crackers with a little butter spread on them.